« How best to communicate science? 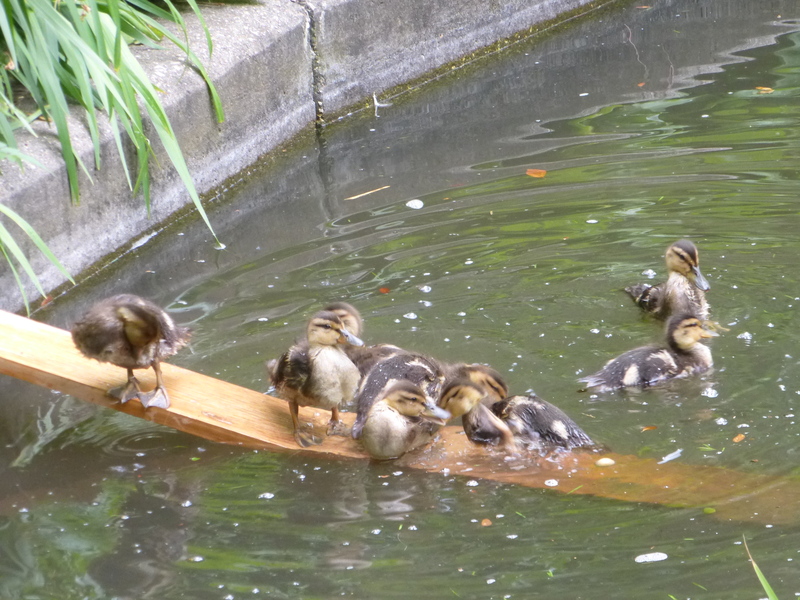 This morning the brood decided to congregate on the duck ramp, which appears to be used by the turtles for sunning and by the ducklings as a convenient place to stand. Nobody seems to actually use it to exit the pond. Eating corn and Starter Waterfowl Chow on the grass. They are ravenous today, and I can see that I was wise to order another fifty pounds of the stuff (it’s arrived). But I’m sure that once they’re even larger, I’ll be ordering a lot more. I’m a Duck Farmer now! Two views of the girl responsible for it all: my beloved Honey. Her blue speculum is particularly lovely this year. 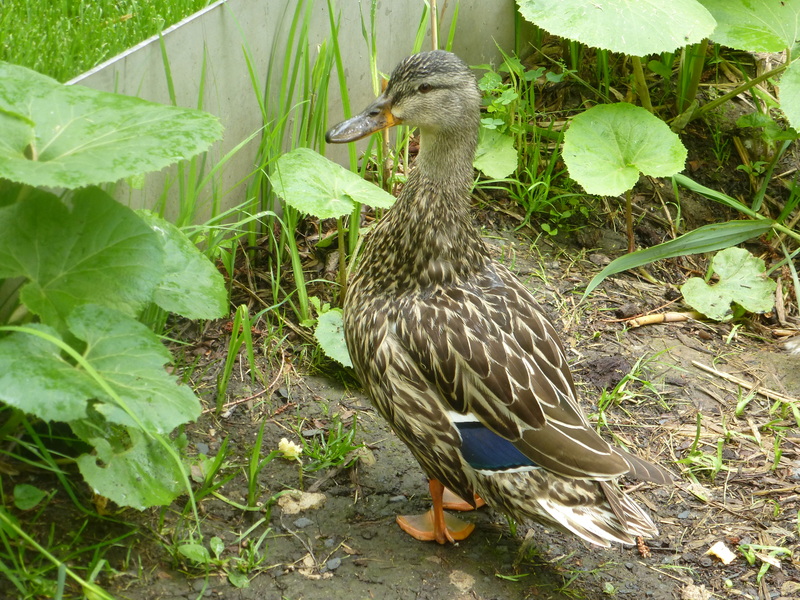 As the ducklings get older, they get more brazen and independent. 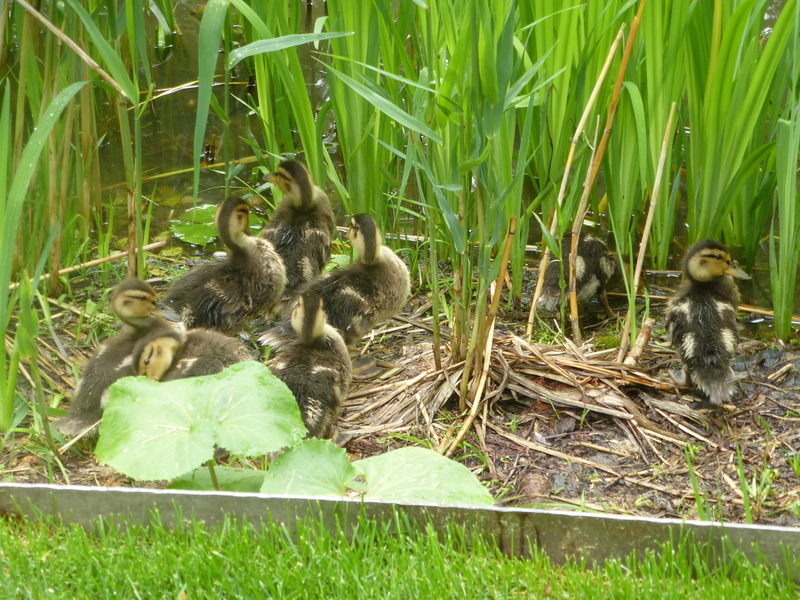 Here they are congregated on the bank while Honey is elsewhere—chasing Henry out of the pond! This entry was written by whyevolutionistrue and posted on June 8, 2018 at 3:00 pm and filed under ducklings, ducks. Bookmark the permalink. Follow any comments here with the RSS feed for this post. Both comments and trackbacks are currently closed. Honey is beautiful (I meant to write)! The duck reports are always most interesting. Thanks for them. Maybe they’re three years old. Her blue speculum is particularly lovely this year. I do enjoy reading these updates and following the progress of the duck family. 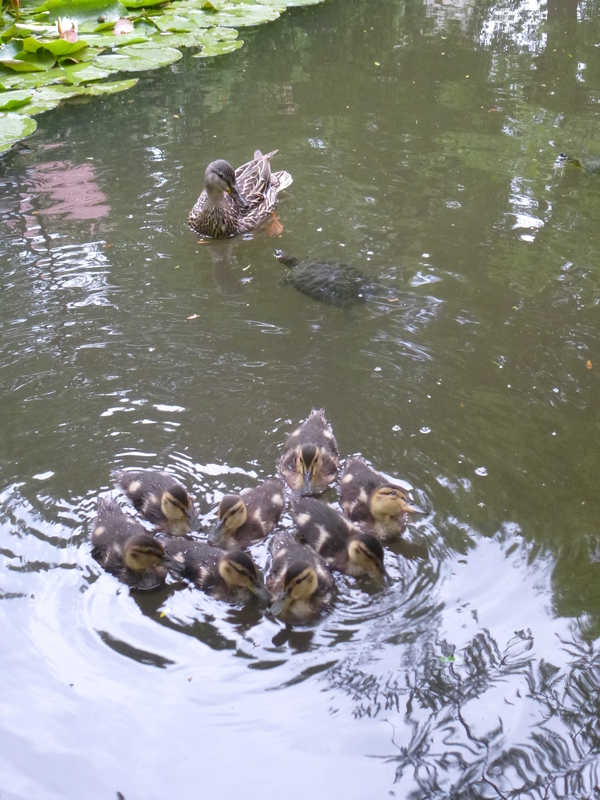 I worry a bit that the ducklings are perhaps too dependent on your feeding? They will need to fend and forage for themselves one day. Will you wean them off a bit or will they just become semi-domesticated? They already fend for themselves most of the time. What Jerry gives them is supplementary feeding. 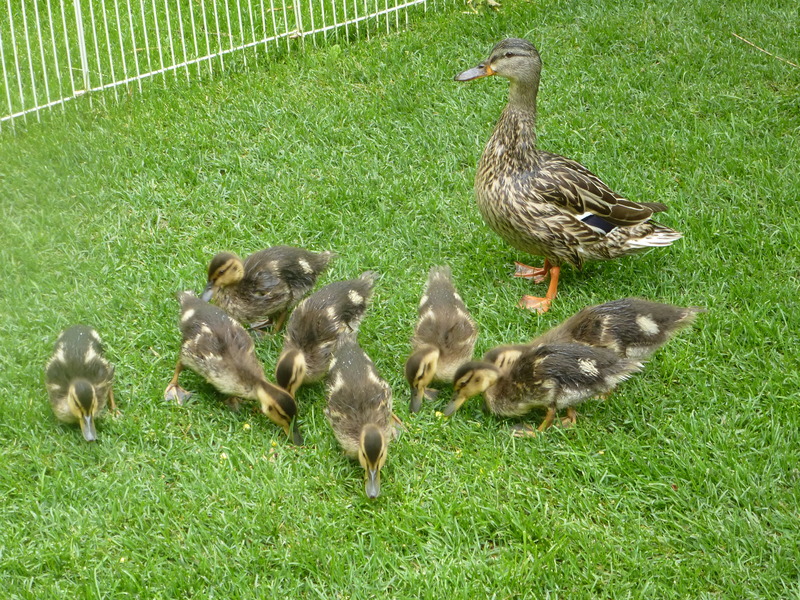 He’s basically ensuring Honey can fledge all eight remaining ducklings instead of just 2-3. No one says this about the bird feeders people have, for example, that enable more birds to survive the winter. 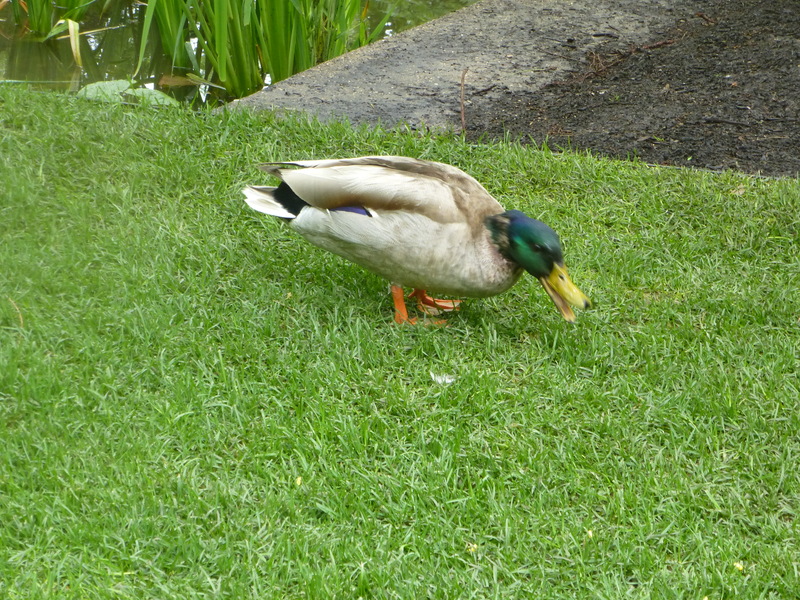 They have a natural instinct to forage, and Jerry has posted plenty of pics of them doing just that. They don’t spend the majority of the hours each day that he’s not there waiting for him. Remember too that he did this last year and all the ducks and ducklings flew off for warmer climes at the appropriate time. Thanks. I am aware that bird feeders enable more birds to survive. 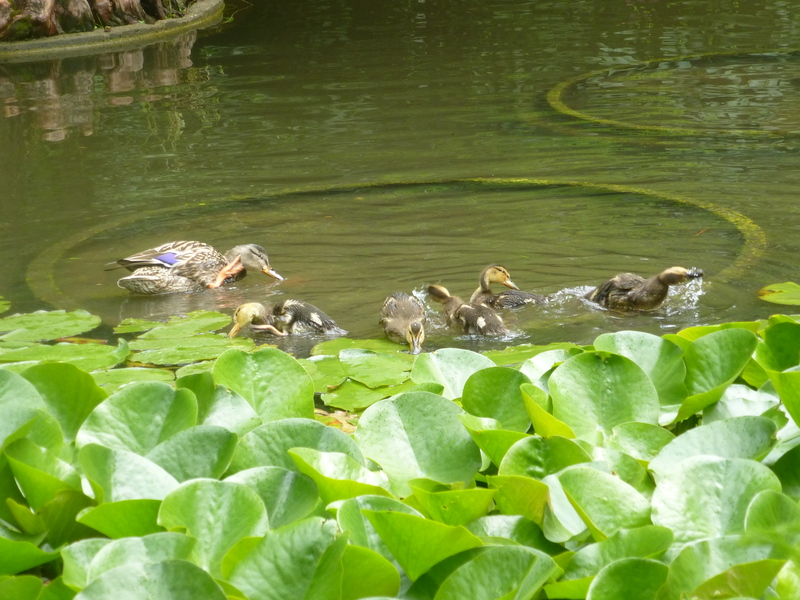 It will be great to see all the duckling make it to adulthood, knowing that in the wild only 1 or 2 might. But when Jerry mentioned 50 pound bags or more, that seems an awful lot. I just worry it will be tougher on them when they do make the decision to go on their own if they rely too much on the duck chow. Of course, that’s nature’s way as well. It seemed like a lot to me, too, but then I thought of how many mouths he has to feed, eight fast growing little ones and three adults. All of them will be so healthy when they’re ready to fly on their way. Sorry if I sounded sharp. It’s just that the same thing has been said before, and the same response has been made before. I also tend to defend Jerry because he’s a friend as well as our host, so I get a bit carried away. 50lbs does sound a lot, but there are eleven ducks, and it’s quite a while before it’s time for them to fly off, and it’s cheaper buying in bulk. I wouldn’t be surprised if he had to buy more before the season is out. I am enjoying the reports about your duck farming career and also wondering whether Ceiling Duck is behind this greatest duck story ever told. Surely you must be thinking about giving the brood biblical names. And the world just got a little better. One problem for the ducklings is feral cats. Yes, I know that it is hard to believe that a member of PCC(e)’s beloved species would harm PCC(e)’s ducklings but it is a fact. The facilities people have a solution which you can see in the fourth picture. They put up temporary fences. 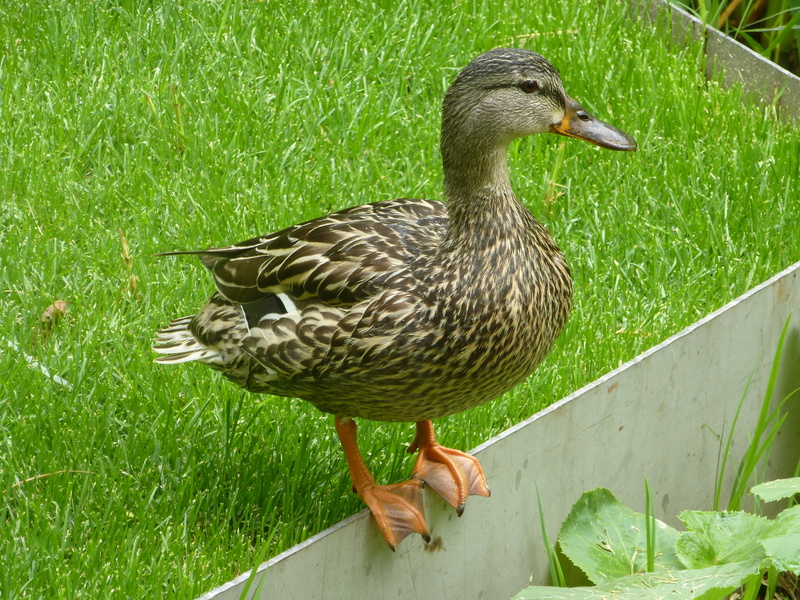 Did you notice the Amazing Fact that your Duck Ramp is BENT!! How can “Science” even begin to explain it?? It wasn’t bent when you installed it, but now it clearly is! Malevolent forces at work? Revenge of Deepak? A true Mystery that only some Religion can possibly explain! I hope they all grow up. Just what the ducktor ordered…. duck therapy for a ghastly day. Thanks, Jerry. Was Honey glaring at the turtle in the first photo? She’s chasing the wrong guy out of the pond! Henry’s a keeper I tells ya! Frank needs to get a job lol.